This is a Colourful Feather.It is used to decorate your books, homes, etc. It is very helpful to do art work. Black Ostrich Feathers Size 10"
A very bright color set with diffrent combinetion with diamond & with sami pricous. Due to our enormous understanding and massive knowledge of this business, we are involved in offering Decorative Feather. 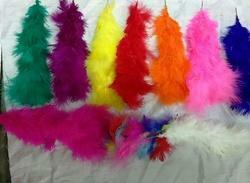 Being a well-distinguished company in the market, we are into offering Artificial Feather. - They are used to clean computers, audio, video, electronic equipments, automobiles, glass products.